Saudi Aramco’s 400,000 barrel per day export-oriented refinery in Jizan will begin operations in 2018 at the earliest, but the complexity of the project means it is hard to predict when crude products will hit the market. The Jizan refinery, located in the remote southwestern Jizan province of Saudi Arabia on the border of Yemen, is starting to rise from the ground and some of the first long-lead items have arrived, says Suleman Al Bargan, general manager of the Jizan refinery complex, at a briefing in Jizan. The 400,000 bpd scheme is the third in Aramco’s recent downstream push, but it will be the first the state-run firm will tackle on its own. At the peak, there will be 70,000 people on site to build the refinery and associated economic city, making it Aramco’s biggest project without a partner. 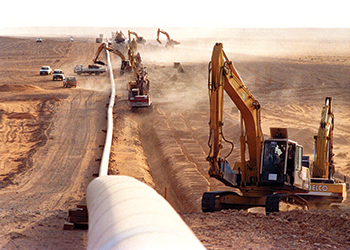 Aramco was assigned to take on the project in 2010 by the government after efforts to offer the project to the private sector flopped. Two other similar-sized $10 billion facilities, Satorp in Jubail and Yasref in Yanbu, were joint ventures with Total and Sinopec respectively. Satorp came fully on stream in 2014 and Yasref is steadily ramping up production. Jizan will be a semi-conversion refinery, making it less complex than the full conversion Satorp and Yasref plants, which have an additional coker unit to process heavy ends into more valuable products. But Jizan is part of a massive integrated facility, covering 16 square kilometres, that links to the world’s largest gasification power scheme, which will double the current production capacity of the south of Saudi Arabia. All will be located in the 106 sq km Jizan Economic City (JEC), part of an initiative by the late King Abdullah in 2006 to bring jobs to one of the poorest parts of the kingdom. The gasification plant will take the vacuum residue from the refinery, which is typically used to make fuel oil or coke, and create gas feedstock to run a massive 4 gigawatt power plant. The power plant will send between 2.2-2.6 GW to the local market with the rest being used for the industrial complex, Al Bargan says. Aramco awarded the engineering, procurement and construction (EPC) contracts for the power plant and gasification unit last April, and the contractors are 60 per cent through the detailed design phase, the official says. All plants will need to be built, commissioned and started up in concert with each other – in one of the most remote parts of Saudi Arabia that has little experience with the oil industry. Taken together, Al Bargan says Jizan could be a higher degree of difficulty than Yasref or Satorp, which took almost a year to ramp up to full production. "Gasification is a fairly new concept for Aramco and definitely for the Mideast. Using synthetic gas from a refinery to produce 4 GW of power is really unique," he says. Aramco inked EPC contracts for the refinery in 2012, but the project has faced a number of setbacks, pushing it back from its planned 2016 finish date. Changes in scope to the project, including adding the gasification plant, have resulted in contractor delays. Several contractors including SK Engineering, which is building the crude distillation unit, have demanded higher payments from Aramco to cover the changes, with the state firm relenting and agreeing to pay some $200 million more instead of cancelling the contract as it threatened to do in December, Middle East Economic Survey reported. The construction on the refinery is scheduled to be complete by end-2017, and then it will take at least six months to ramp up production, Al Bargan says. That means first products will be likely in the second half of the year. The refinery will process Arabian Heavy and Arabian Medium crude to produce gasoline, ultra-low-sulfur diesel, benzene and paraxylene. Crude will be supplied by tankers, not pipeline. Some products will be used locally, while others will be exported. Aramco was also assigned to handle the first phase of the JEC in 2013 after the developer was dismissed. In addition to the refinery, gasification plant and power station, it is responsible for the new deepwater port, along with the water, sewage, roads and power infrastructure to service the whole city.